Alexis Maillet ’19 has wanted to be a doctor for as long as she can remember. 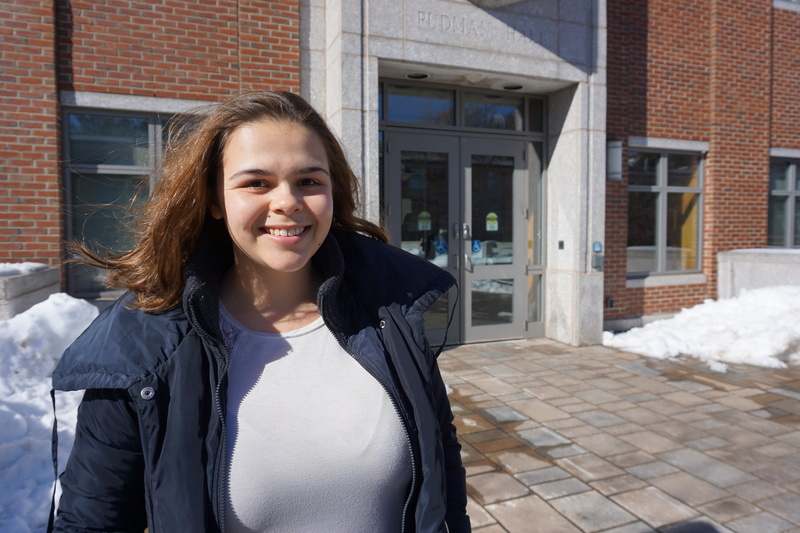 Now the biomedical science: medical and veterinary sciences major from New Ipswich, New Hampshire is on her way: this January, she began the long medical school application process. Alexis Maillet: I am proudest of the fact that I survived organic chemistry! No, in all seriousness, I'm the most proud of the fact that even though I struggled a little bit as a freshman, I have definitely flourished over the years. Coming from a very small town where my graduating class was no more than 65 students, it was a bit of a shock to be in classes of 200+. But, if I'm being honest, I'm glad that the more general topics were what I struggled with and not the more specific classes like anatomy and medical sociology. I would rather my strengths lie in the more detailed subjects anyway. Maillet: There are many things that motivate me. My mom, my friends, my desire to do well in my classes, to name a few. Something that I can actually expand on and isn't such a textbook answer would be my volunteer experience. I volunteer at Portsmouth Regional Hospital where I work the desk on some of the medical floors, among other things. The most difficult thing for me about being there is watching the nurses rush around like crazy and knowing I can't help them with a lot of things because I'm not qualified to do so. I feel awful just sitting there while they go from room to room to give patients their medications or draw blood for labs. But above it all, I'm motivated by my love and curiosity of the human body. Especially now that I'm in upper level classes that are taking the entire semester to talk about a single system of the body, I go to class every day and I'm always enthralled by the beauty and intricacies that most of us take for granted all the time! Maillet: I have always wanted to be a doctor. Most of us would say that as children when adults would ask us what we wanted to be when we grew up, but I got stuck in that phase. Big chunks of my life were spent in the hospital, so I guess I felt like it was my destiny to be there. Once I hit high school and took my first anatomy and physiology class, I was definitely hooked. So, when I applied to UNH and figured out this major would fulfill the requirements for medical schools and then some, I knew BMS: MVS was the one for me. And the rest, as they say, is history! Maillet: The plan is to go to medical school It's a two-year process that I will be starting this January. If all goes well, I'll finish school and be out in the workforce by 2028 at the earliest, what with residency and all that jazz. But for the near future, I'm going to graduate from UNH, work as an EMT and maybe even come back here in the summer to TA, and in the fall of 2020, move on to the next section of my life. Maillet: My experience here has prepared me to achieve this goal of going to medical school by teaching me how to multitask and prioritize. The scariest thing about medical school, at least for me, is this big myth that the course load is insanely more difficult and requires a 24-hour study schedule. However, I have been informed by many sources that this isn't the case. What I'll be doing there, I'm already doing here! I've learned how to schedule study time for my various classes, making sure to give each one the attention it needs. And, of course, all of the courses I've taken have set me up perfectly for what I'll be learning during my first two years at medical school. Maillet: This is honestly a remarkable and diverse major. You learn so many amazing things, the professors are great, and you can take that knowledge forward in life and use it to become anything in the health field. And, if you do decide to declare yourself as a BMS: MVS student, take your time! Don't try to overload yourself in the first semester or even the first two years. If it takes you until your junior year to feel comfortable enough with your academic abilities to start joining clubs and such, that's okay! It's better to have a solid foundation that you're confident about and know your limits before you start to push them. Don’t go crazy in the first semester and burn out before you've even begun. Relax. You're doing great. It's okay to focus on one thing at a time. And you'll make it eventually, I promise. Maillet: I think my favorite thing about UNH has always been its location. It's a decent sized campus but it isn't in a city, it's the perfect distance from both the beach and the mountains, and honestly, it's beautiful here. The buildings, college woods, T-Hall, the trees; it's never a bad time to take pictures! I also love that there's always SOMETHING going on: CAB events, hockey games, movies, lecture series, the game room. The list goes on forever. There are so many amazing opportunities to get out of your comfort zone, try something new, hang out with friends, and get away from homework for a little while!